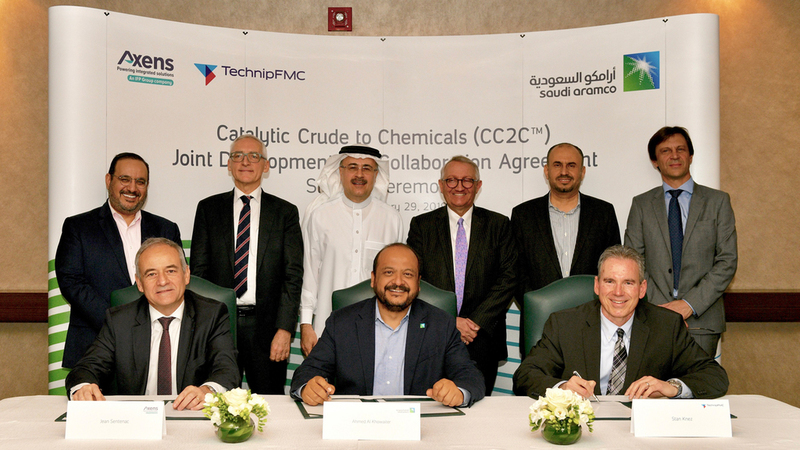 Saudi Aramco Technologies has signed a joint development and collaboration agreement (JDCA) with Axens and TechnipFMC to further develop its Catalytic Crude to Chemicals (CC2C) technology. The agreement aims to commercialise the new technology by 2021. Saudi Aramco CEO Amin H. Nasser said: “Oil will become increasingly more important as a feedstock in the production of petrochemicals. “Saudi Aramco is leveraging its position as the world’s oil powerhouse to capitalise on the strong growth potential for chemicals globally. The technology builds on high-severity fluid catalytic cracking (HS-FCC) technology, which was developed in collaboration with King Fahd University of Petroleum & Minerals (KFUPM) and JXTG Nippon Oil & Energy. HS-FCC converts more than 60% of a barrel of crude. Axens and TechnipFMC are also members of the HS-FCC technology alliance and hold exclusive licences to the technology. TechnipFMC Process Technology president Stan Knez said: “The CC2C technology will be an innovative approach for producing a full range of petrochemicals using crude oil as the feedstock.